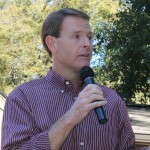 Former State Rep. Tony Perkins, now president of the Family Research Council hosted an old-fashioned political rally last Saturday at his home on Liberty Road in the rural community of Pride, LA, just north of Central. Perkins welcomed the crowd and encouraged them to vote and get their friends to vote in the Nov. 4. U.S. Senate candidate Col. Rob Maness asked those in attendance to support his candidacy against Democratic Sen. Mary Landrieu. Maness has been endorsed by Perkins and his organization, Family Research Council Action PAC. Fifth District Congressional candidate Zach Dasher explained the spiritual roots of America’s problems and urged a return to the principles of the Founding Fathers and to the Bible. Jim Bob and Michelle Duggar, who are featured on the reality show, 19 and Counting on TLC, emphasized the importance of buidling strong families and being well grounded. © 2019 Capital City News. All Rights Reserved.